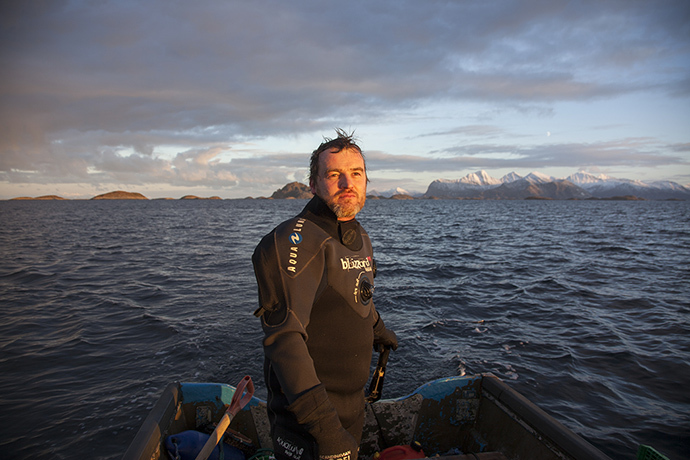 Our urchin diver is a Scotsman who came to Norway for the love of a woman, and stayed for the cold, pristine waters of his new region of Steigen. If it lives in the north Atlantic and I want to cook it, Roddie will find it and it will arrive at Fäviken neatly arranged in a little box, whether it's edible or not." A small icy open boat 300km inside the Arctic Circle: diver Pawel grins as he hands me a holy grail and for a second I forget the biting wind. The interior of the spiky sea urchin he is holding out is an astonishing tangerine like a Chinese lantern, bathed in low brilliant light. What I have in my hand is Stronglyocentrotus droebachiensis, the mythical Norwegian Green, talked about in hushed whispers by chefs. I lift out a delicate coral "tongue" – more accurately, its gonads – and let the umami flavours wash over me: the texture is of wobbly custard; the taste clean, like the smell of the Arctic sea, only sweeter. I close my eyes and quietly drift with the water. 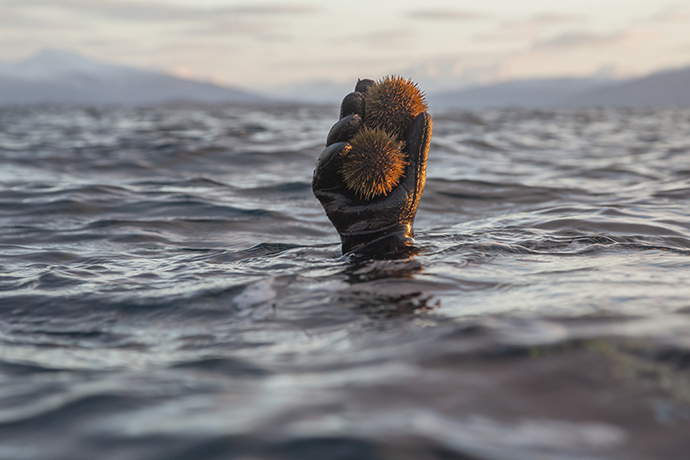 We have plenty of time and urchins while we wait for Roddie Sloan to reappear from the freezing sea. Sloan had known this was a good day to fish, he says, because the sea eagle had told him. "Like most fishermen I have superstitions," he says. "If I don't see an eagle, I know it will be a bad day." And winter days here – if you can call barely four hours of dim light a day – can be very bad. He tells me of a five-hour battle through 4m waves to get his tiny boat the final kilometre home. Luckily, today the fjords are calm, the sun is shining and as we fill the boat with urchins and clams, Roddie Sloan and Pawel "The Fish" Laskowski are happy. Just a few years ago, Sloan was ready to quit the sea. The millions he dreamed he'd make from diving had failed to materialise, unlike his second son (he now has three). Anxious about how to support his family, Sloan hung up his wetsuit to study engineering. But then came a phone call that would change his life. "I remember the day," he tells me later as I stoke the log fire in our borrowed white wooden house on a tiny island in the fjord. "It was a sunny Sunday, a beautiful autumn afternoon, Lindis [his wife] is making dinner while I am standing on the terrace. The phone rings. It's a chef wanting urchins but I tell him he is too late. It isn't fair to my wife any more, it is over. "In my mind I already had autumn organised," he continues. "I was going to university. We spoke for about an hour, about sea urchins and other foods from the sea, but he was a two-star and I had been supplying Le Louis XV [Alain Ducasse's three-Michelin-star palace in Monaco]. I was polite but I wasn't interested. "When we had finished, Lindis asked who it was," he says. "Some Danish chef, I told her, calling from Nimrod or Nana, I don't care. I am going back to school." It was, of course, René Redzepi from Noma. Sloan borrows a fishing boat to get his dinghy out to the sea urchin beds he has mapped in the closed season the previous year. Once picked he will not return to the same bed for five years. Under pressure from Lindis – a super-smart Norwegian gender specialist and government adviser – Sloan succumbed but tripled his price: "If you don't want to do something, you hike the cost," he says. "But I didn't want Lindis to be angry." "With René," he says, "the price doesn't much matter, it is about the product. This was an extremely new experience for me." But Sloan was intent on leaving the sea. "I still wanted to study, so he was my only client." A few weeks later, Redzepi turned up. "He was wearing trainers to go to sea," Sloan laughs. "He had a new hat, he had duty-free, but was in all the wrong clothes. We kitted him and took him out for four hours. The season was finished, it was minus 22. We talked about changing nappies, about family, philosophy and sea urchins. "I realised I really like this guy," he says. "I am a loyal dog – once I have made up my mind, it takes a lot to get rid of me. I tell him we will change the price, he tells me he wants 50kg a week." Next, he ate his green urchins at Noma: "It was a dish of 'frozen pebbles and sea urchins' – an amazing taste sensation, suddenly I saw what he saw." Sloan, a Scottish economic exile from Dumfries, transplanted to Nordskot, an Arctic hamlet of 80 people, had found another new home. "Noma has become 'my kitchen' in a way," he says. "I can drop in for tea, coffee, maybe curl up under a table." Through Redzepi and his MAD [food] symposium in Copenhagen (Sloan was a reluctant but compelling speaker at the second event in 2012), he has found validation and a viable market with many of Europe's top chefs now clamouring to buy from him. We soon found a logistical solution that was manageable for us both in terms of money and quality, which involves a couple of ferries, a firm of removal men and a monthly bribe of a box of beer. 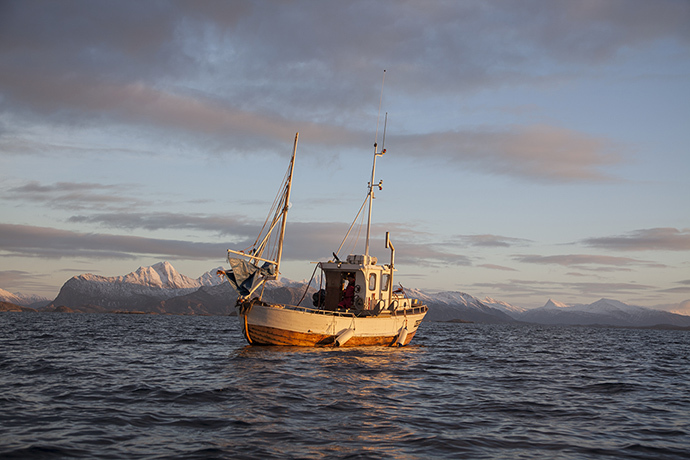 The produce arrives every Tuesday at Fäviken and it includes the best sea urchins I have ever seen anywhere." This season – late September to January – Sloan will also be supplying UK restaurants including St John. For now at least, wild talk of further education is on hold. Ask Roddie Sloan about his relationship with his adopted community, the Arctic sea, and its produce, and his voice becomes quieter. We make tea and talk about Nordskot's oldest inhabitant, 81-year-old Finn Ediassen, who started fishing aged eight and taught Sloan "all I know about ropes and knots". He tells me how this community nestled at the foot of an austere mountain range at the top of the world had carved a precarious living fishing and whaling but now there was no work; how they had indulged his obsession with the urchins and clams they still only think of as bait. 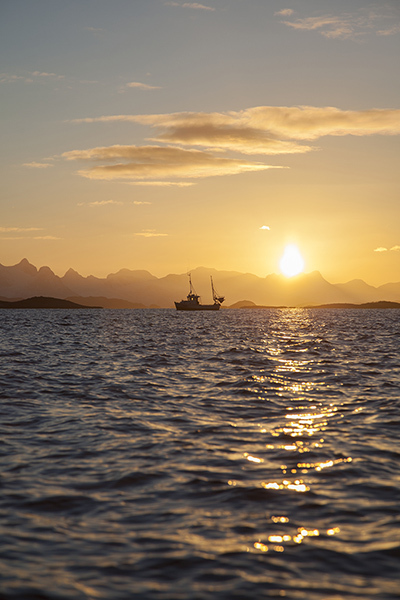 The midday sun goes down on northern Norway, three or four hours of winter daylight fade. The Arctic light dips. Sloan's eyes shine as tells me of his pride in how they have taken him in, recognising a kindred wild spirit bewitched by the sea. But it is when he talks about being a warden for his beloved urchins that Sloan comes alive. The green is one of 700 species, 500m years old, he says. "The quality starts in the sea – how you pick it up with your hand, how many you have in the net. How you handle it, how you fish it. "They have changed my life, these beautiful creatures," he says. "My mother doesn't understand it. For her, they are still something my Aunty Jean brought back from her holidays. But they have given me a community, friendships, food. They have given me a place, a proper life." All the while, a few urchins shyly shift and move as we talk. As daylight finally fades, I watch entranced as they dance on spikes across the kitchen table. "They are very precious to me," Sloan says softly. Later, I am sitting drinking smoky scotch when Roddie Sloan calls from his home in the village. "Look outside," he says, simply. "Northern lights." So I stand on the terrace of my Arctic explorer's island cottage and watch as the sea and sky come alive. I see electric greens shoot and pulse over the forbidding horizon as though orchestrated to an unheard symphony. I watch the sky and fjord turn the intense colour of limes and the stark icy mountains take on an unearthly mauve. And for the next three hours as I drink whisky and watch, I almost envy Roddie Sloan his hermit life, the few hours of daylight, the many hours spent diving in the icy water. But then I remember the forecast is for more storms, more snow and minus 15 and I shudder and return to the fire.